Marinate your venison by placing it with the marinade ingredients into a Weston Vacuum Sealer Bag and then sealing and refrigerating overnight at least. Lightly sautee garlic, shallots, and mushrooms in butter, then whisk them together with eggs and olive oil. Set aside. Keeping your meat and fat as cold as possible, grind it through the coarse plate of your Weston Meat Grinder. Hand mix your meat with the egg mixture then grind it again, this time through a fine plate. Fold the breadcrumbs into the ground meat, then press it into a loaf pan. 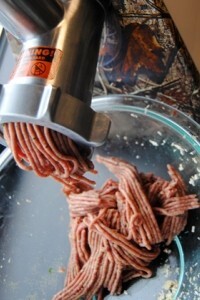 Using a Realtree Outfitters #8 575 Watt Camo Grinder by Westonto grind together venison, fat, and seasonings. Bake at 325 degrees for an hour, or until the internal temperature reaches 155 degrees. 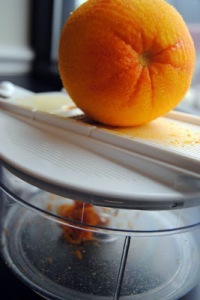 While the meatloaf bakes, use the grating attachment on the Weston Kitchen Mixer to zest your orange. Place the remaining sauce ingredients into the mixer and blend well. Place in a small sauce pan and simmer for 10 minutes. Slice and serve meatloaf immediately with warm cumberland sauce drizzled over top.